WHO grade determinations are still made on the basis of histologic criteria. Another reason why phenotype remains essential is that, there are individual tumors that do not meet the more narrowly defined phenotype and genotype criteria, e.g., the rare phenotypically classical diffuse astrocytoma that lacks the signature genetic characteristics of IDH and ATRX mutations. 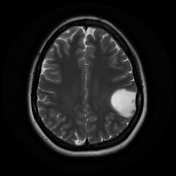 Nevertheless, it remains possible that future WHO classifications of the diffuse gliomas, in the setting of deeper and broader genomic capabilities, will require less histological evaluation—perhaps only a diagnosis of “diffuse glioma.” For now, the World Health Organization Classification of Tumors of the Central Nervous System 2016 is predicated on the basis of combined phenotypic and genotypic classification, and on the generation of “integrated” diagnoses. Diffuse astrocytoma and oligodendrogliomas are in this classification now nosologically more similar than are diffuse astrocytoma and pilocytic astrocytoma; the family trees have been redrawn. In the setting of a diffuse astrocytoma or anaplastic astrocytoma, if IDH testing is not available or cannot be fully performed (e.g., negative immunohistochemistry without available sequencing), the resulting diagnosis would be diffuse astroctyoma, NOS, or anaplastic astrocytoma, NOS, respectively. Historically, the prognostic differences between WHO grade II diffuse astrocytomas and WHO grade III anaplastic astrocytomas were highly significant. Some studies, however, have suggested that the prognostic differences between IDH-mutant WHO grade II diffuse astrocytomas and IDH-mutant WHO grade III anaplastic astrocytomas are not as marked. Nonetheless, this has not been noted in all studies. At this time, it is recommended that WHO grading is retained for both IDH-mutant and IDH-wildtype astrocytomas, although the prognosis of the IDH-mutant cases appears more favorable in both grades. Cautionary notes have been added to the 2016 classification in this regard. Of note, two diffuse astrocytoma variants have been deleted from the WHO classification: protoplasmic astrocytoma, a diagnosis that was previously defined in only vague terms and is almost never made any longer given that tumors with this histological appearance are typically characterized as other more narrowly defined lesions; and fibrillary astrocytoma, since this diagnosis overlaps nearly entirely with the standard diffuse astrocytoma. As a result, only gemistocytic astrocytoma remains as a distinct variant of diffuse astrocytoma IDH-mutant. For the diffuse astrocytomas, there have been many such studies over the past century and these have proven useful in estimating prognosis for patients. With the advent of molecular diagnostics and the recent World Health Organization (WHO) Classification of Tumors of the Central Nervous System it is necessary testing for isocitrate dehydrogenase (IDH) gene status in the classification of diffuse astrocytic gliomas. Novel approaches to diffuse astrocytic tumor grading are required in the era of IDH testing 1). Alattar et al. determined the influence of age and tumor location on survival benefit from GTR in diffuse astrocytoma (DA). They used The Surveillance, Epidemiology and End Results (SEER) database (1999-2010). They used Kaplan-Meier curves and Cox survival models to determine the survival benefit from GTR in populations stratified by age and tumor location. They determined the prevalence of the IDH mutation (mIDH) using The Cancer Genome Atlas (TCGA). They identified 1980 patients with DA. For frontal DAs, GTR resulted in improved survival relative to subtotal resection in all ages (age ≤50 years hazard ratio [HR], 0.56; P = 0.002; age >50 years HR, 0.41; P < 0.001). For nonfrontal DAs, only patients ≤50 years experienced improved survival with GTR (age ≤50 years HR, 0.55; P = 0.002; age >50 years HR, 0.78; P = 0.114). For patients ≤50 years with frontal tumors, survival was comparable between DA and AA after GTR (75% survival DA: 80 months, AA: 89 months, P = 0.973). In TCGA, these tumors were nearly uniformly mIDH (DA: 98%; AA: 90%, P = 0.11). However, for patients ≤50 years with nonfrontal tumors, there was a survival difference after GTR (75% survival DA: 80 months, AA: 30 months, P = 0.001) despite comparable mIDH prevalence (DA: 82%, AA: 75%, P = 0.49). Age and tumor location modify the survival benefit derived from GTR in DA. Survival patterns in SEER imperfectly correlated with mIDH prevalence in TCGA, suggesting that tumor grade and mIDH status convey nonredundant prognostic information in select clinical contexts 2). von Deimling A, Ono T, Shirahata M, Louis DN. Grading of Diffuse Astrocytic Gliomas: A Review of Studies Before and After the Advent of IDH Testing. Semin Neurol. 2018 Feb;38(1):19-23. doi: 10.1055/s-0038-1636430. Epub 2018 Mar 16. PubMed PMID: 29548048. Alattar AA, Carroll KT, Bryant AK, Hirshman B, Joshi R, Carter BS, Harismendy O, Chen CC. Prognostic Importance of Age, Tumor Location, and Tumor Grade in Grade II Astrocytomas: An Integrated Analysis of the Cancer Genome Atlas and the Surveillance, Epidemiology, and End Results Database. World Neurosurg. 2019 Jan;121:e411-e418. doi: 10.1016/j.wneu.2018.09.124. Epub 2018 Sep 26. PubMed PMID: 30266697.